Ronald James Darko sent me this mix a few weeks back and I was surprised. He actually did it! 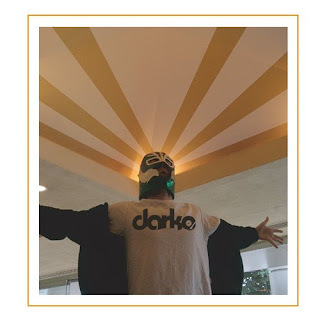 ... And in true Darko form he has no idea what the songs are on here!!! Awesome! The tracklist is a picture of the records that were laying around on his floor. While his favorite songs are 90's rap Jams (most notably House of Pain's "Jump Around" and Pharoahe Monch's " Simon Says") this mix, mysteriously, doesn't include any of those. If you have ever had the pleasure of going out on the town with Ronald, think about that when you listen to this mix. If not, well, here is a window into that groovy experience. Easy like a sunday morning. "When I read Chris' post about 'one-take mini-mixes' on this here very blog, I immediately called him and asked if the Darkness could participate. He, being the worlds nicest guy and unable to say no, indulged my fantasy of creating what can only be described as "musical heaven". 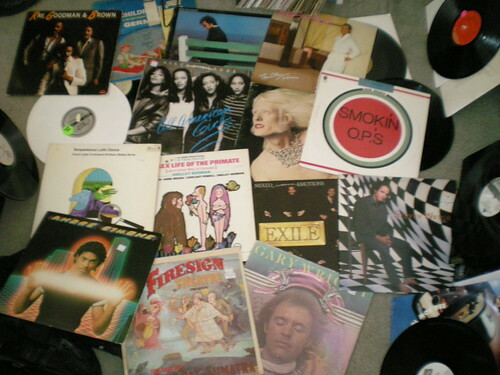 With no clear agenda or game plan, I quickly began grabbing random records off the floor. Eventually, ending up with something that eerily reminds me of our once heralded Tensdays night at the Ottobar. Atleast musically, since many a random track and trainwreck were always present. Along with all of our friends yelling in our faces and making the "airhorn" noise whenever they heard a blend going off or even the slightest of needle skips. So, download this mix, down a beer, push play and push the person next to you... Afterwards, immediately return to the blog and leave a comment on how great it feels to have been given a glimpse of heaven... and not had to have died (or gone to Baltimore) to see it!" some mixes show the listener a dj's skills at mainstream music capabilites, technicalities; other mixes give the listener a glimpse into the dj's mind, a glimpseof the mad music brillience within. I can just imagine Darko leaping around his room in the mask he's pictured wearing making this mix.